French producer Zimmer is no stranger to our ears. His catalog of “horizontal disco” singles, remixes, edits, and EPs over the years from labels like Discotexas and Roche Musique will forever find rotation in that blissful summery house sound. It's almost weird to think that we’re only now anticipating the first full-length album. "Landing," the first track from the forthcoming album, debuted a few months ago. It showed a much darker and pensive side to Zimmer's music in comparison to most of its predecessors. We’re also just ahead of the start of what will be the producer's first ever live show featuring visuals, shifting away from doing a DJ set. With that about to kick off, we were lucky enough to chat on the phone with Zimmer as he shed some light on his new show, the forthcoming album, and his creative process. EARMILK: I understand you’ve been in New York. How’s that been? ZIMMER: Pretty intense to be honest. Basically what I’ve been doing on this trip is getting the lights ready. I was basically working on all the lights that are going to be happening during the show. Like, we were programming for every single track. I’m actually shooting a little something on the rooftop tonight. I’m just hoping… You’re in New York too, right? EM: I’m just outside in New Jersey. Z: So yeah, we have the same weather then. I’ve been stressing about the weather because we’re shooting outdoors. EM: Oh yeah, today I don’t think it’s a good day for outside. EM: What else can we expect other than the light show from the live show, for the tour that’s coming up? Z: I mean it’s going to be completely different. The main thing obviously music-wise–I’m going to be playing synths, drum machines, different aspects. That’s very different from DJs sets, which is the format that I’ve been performing in for the past like 5 years. That’s a big challenge for me to… it’s completely different. There’s going to be that and there’s going to be a bit of projection as well. It’s going to be like the fuller version of what I have in my mind when I make music which is the most important thing. The mood in the room, the light, the smoke, everything that we’re creating is going to be so much more in sync with what I have in my mind when I’m actually making the music. I think it’s going to be very different from what people have experienced from me before. EM: I’m excited to see it. Is there a city that’s you’re most excited to see or go to? Z: Honestly, just New York, because I was basically living in New York for the past year. I moved back in June. I’m here again now. Just the fact that I’ve been in New York so much, and a lot of my friends are going to be there. My parents are flying in… that’s an important part to me. So yeah New York should be super important. And the guy I’m making the show with is from New York. It’s just a very important city for me. It should be pretty exciting. And Rough Trade is a very cool one. Inside it’s a very nice feeling and for everyone watching the show it’s going to look very good in this room. Even better than I could have even known. It’s a great venue for the show. I mean all of them to be honest! The other thing is it’s going to be a driving tour, from the East Coast. It’s something I’ve never done. I always fly or take the train to shows. We’re going to be like in the van with my tour band and tour manager. It’s definitely a different dynamic also when you travel by land. You get to see everything and like connect the dots. When you’re flying, everything’s all so virtual in a way. I’m pretty excited for that trip. It’s going to be one big road trip. EM: Yeah, that’s the way you have to see The United States, by car. Z: Yep, I mean, I’ve done my fair share of driving on the West Coast. I’ve done all the national parks and that sort of stuff, but doing it on the East Coast should be exciting. And at the same time, it’s kind of crazy. I’ve never played live and the first time I’m going to play live ever is in The States and it’s like a full driving tour which is like a musician’s dream–I think. So I feel very fortunate to be able to do that. EM: That’s cool! The track and video that came out for “Landing,” it was very much inspired by your father’s research in science. Could you talk a little bit about how that came together? Z: Actually, I made the track originally last winter, like winter 2017. And the track came together really quick, like in 2 or 3 hours. It virtually became almost what it is now. When I make music I don’t think anything out, I just let the emotions flow. I get carried by the music itself, I feel things and when I finished the track I… In Paris, I live in this apartment that’s pretty tall so I see a lot of the city and I sat down in front of the view, put my headphones on, and played the full track. I felt something nice and I felt this sensation of accomplishment in completing something. That feeling echoed what I felt when I learned my dad and his team had discovered gravitational waves. It’s really this feeling of searching for something for a long time and finally completing that. That’s kind of the feeling I had. Then I realized it echoed this feeling about my dad, and that was the perfect way to paying homage to what they did. Because what they did basically shaped my life. That’s why I wanted to do it. The fact that he was a researcher also pushed me to, I guess, my musicianship. In music, I try to search and push boundaries. So yeah, right now he’s a really important figure in my life so I just wanted to pay homage to him. EM: Have you ever thought of becoming a scientist? Z: I was like the worst in my class in physics and math when I was a kid. I was very very bad. I have a younger brother and he’s much more into science. I’ve always been the like weird artsy guy in my family. So that was really never an option. EM: It happens. Is there anything else on the album that is like, so inspired? Z: It’s more a track for track thing I think. Each track has its own little story and is influenced by something. You’ve heard the whole album, right? EM: Yeah, I’ve listened to whatever it was–the 95% of it. Z: Cool, yeah yeah yeah, it’s like literally each track has its own story. So now that I’m at the end of that I’m trying to tie everything together. For instance, the next track I’m releasing which is the one called “Wildflowers” with Panama singing on it. That track, for instance, was the very first I made, and I made that one in LA. It was in the winter, but it was super warm. So that’s more like my LA-ish track. I get very inspired by my surroundings also. Like most of the techno stuff I made in New York last winter. But basically, I made the album between Paris, LA, and New York. Each track really speaks to where I made them as well. In terms of personal stories behind it, “Landing” is definitely the big story. EM: From what I’ve heard it’s very dark, chilled, and cerebral album. I think it has one theme or sound, but it’s definitely different from say your Discotexas grooves. Would you say that it’s been a conscious shift at all? Z: Yeah definitely. I mean, I think like endless summers do not exist. At one point when you’re making summery music all the time, you kind of want some calm tracks and explore new territory. As an artist, that’s interesting to me. I don’t want to keep making the same thing all over again. I felt, I guess–I never released a disco album, but I released enough tracks, remixes, edits, that I felt I could get by with that work and I was happy with what I did. And I mean the change in sounds, it came from DJing. I started DJing more and more, and later and later, and when you play a big dark club it’s like more techno-y and I think darker music than superpop, warmer tracks, beach stuff like I was doing before. And also I’ve grown in terms of letting myself go when I make music, which is something very important to me, not working too much and let the music come. I think I was a bit more conscious when I was making music before. Like oh, I want to make that kind of track and then it needs to be like this, this, and this. Now it’s more like okay I just do whatever and see what happens. So and that’s the result of that. Z: It’s also very scary because I built something, like a connection with people through the disco music and I do hope people follow along. I get emails, like the other day for instance, I got a message on Instagram from a guy like “Oh I miss your old mixtapes, what a drag or whatever.” These were mixtapes from like 2012. And I feel very happy that people connected so very much to those mixtapes and those tracks from back then, but I do hope they have the curiosity to listen to the new stuff. I think we all listen to a wide range of things. Z: The other thing also, I wanted the album to have a lot of contrast. I wanted the harder tracks to be really dark and have this very lazy feel about them if it’s more extreme. And I wanted soft tracks that are also airy tracks, very mellow. I like the contrast in music. This is one thing I think in every one of my songs there’s like a big… I think I’ve kept the interest in parts, like the ups and downs. I love these tracks, like some tracks are warm, some tracks very mellow, some tracks are somewhere in between. I like music that has a wide range and I think with the album that’s what I tried to do like I had a wide range of everything I’m kind of in to, but that stuck back together by the way I make music, cause of action, and my style. EM: I really like the shift, I think it’s really gorgeous, and I think it comes off very nicely. What would you say has been the most challenging part of this, your first full-length album coming together? Z: I need to think for a few seconds because I never really asked myself this. The challenging thing is to start from scratch, because what happened literally after the last EP, I was like okay “I don’t have any tracks, I’m on a race now, I feel like it’s album time, so I’m going to make an album.” So every track I’ve made since was in that perspective. So that’s kind of scary where you have nothing. I had like ideas and conflicts I wanted to, like this thing like contrast. I knew I wanted in the album, but that was pretty much it. And then I tried to make to like 12 tracks that work together and sound like an album. But that’s what’s scary at first, like all of it happens very naturally. I just kept making music the whole time and one day I was like, “Okay, what if I had an album?” Then I just kept making even more music, and now it’s starting to feel complete. EM: Is there any sort of time frame we can expect it to be out? Z: Yeah I think, I don’t know when we’re making the announcement, but basically it should be out in March. I would love to release it today because some tracks I’ve made a year and a half ago because I started making it in 2017 but you know how it is. You need to have the proper everything. EM: What could we expect looking forward into 2019, it’s coming up. I mean obviously the live show is a lot, and the tour, and the album, and everything. But beyond that? Z: I mean honestly, I don’t really know, there’s so much going on. Yeah, putting the record out the right way. Making sure also like, the art direction is on point. That’s a big part of this album, for the first time I’m working with an art director for all the graphic stuff. I used to make everything myself, like all the covers I made, I did before. So that’s going to be quite interesting also to collaborate with. I’m working with a very talented guy, kind of an older guy that has a big history of working with electronic artists, like French electronic artists. So we’re going to be working on new music videos, new ways to showcase the music. We’re also working on a live concept that cannot really travel, that’s more an art installation. So hopefully we can find spaces to do this. So we’re really going to try to do interesting things artistically to present this music in the best way possible, to make sure that the notion of when I made the record translates with people. And I think this, also doing things in the real world. Like, that’s something I’m really looking forward to. Because everything is so much is about what’s hype on Instagram, like all that digital stuff, and I really want to build experiences for people. Like have people come to the show, experience it, everything moving, like the smoke, the lights, the loud sound, the mellow sound. So yeah the concerts are the first part, but if this concept we’re working on—sort of live art installation if we can get that to work that would be really interesting. EM: I think so too, I’m very excited. Are you going to do vinyl at all? I have to personally ask. Z: Yeah, yeah, we’re going to press the record on vinyl for sure! EM: Awesome, I think it will sound beautiful. 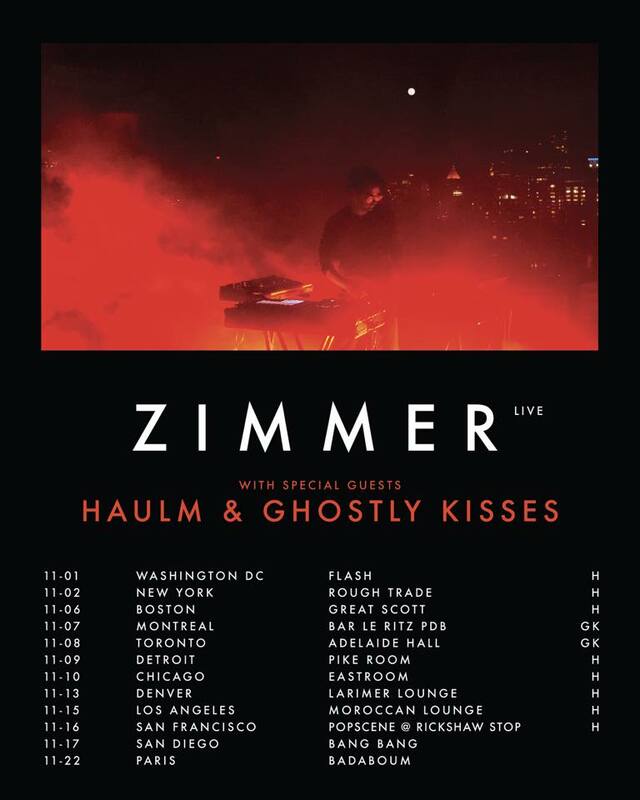 Zimmer's live tour kicks off in a couple weeks, starting in Washington, D.C. Check out the dates below to see when all the smoke, lights, and chill tunes will be coming to your area. Be sure to follow along with Zimmer as more of this new album unfolds.